The Cummins-powered Baltimore Sentinel is 63 feet in length, with a 20-foot beam, and a 3-foot draft. 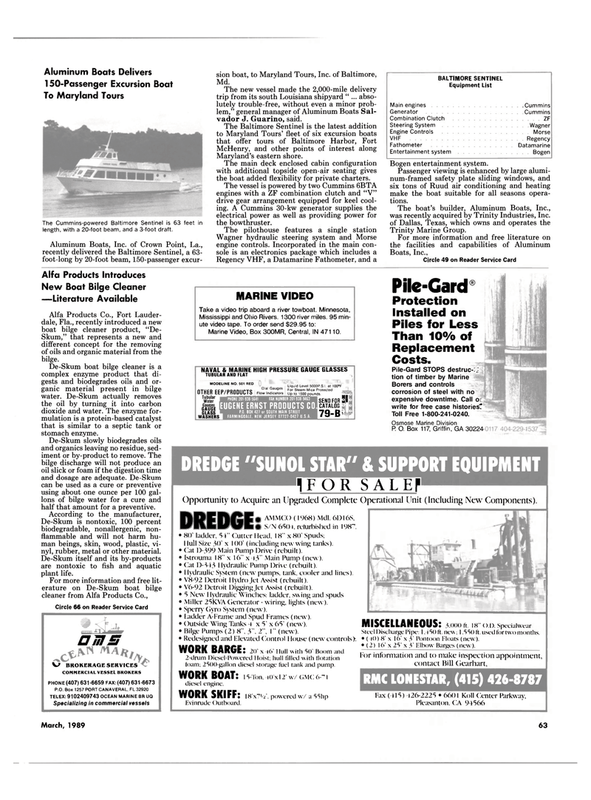 The new vessel made the 2,000-mile delivery trip from its south Louisiana shipyard " ... abso- lutely trouble-free, without even a minor prob- lem," general manager of Aluminum Boats Sal- vador J. Guarino, said. The vessel is powered by two Cummins 6BTA engines with a ZF combination clutch and "V" drive gear arrangement equipped for keel cool- ing. A Cummins 30-kw generator supplies the electrical power as well as providing power for the bowthruster. Passenger viewing is enhanced by large alumi- num-framed safety plate sliding windows, and six tons of Ruud air conditioning and heating make the boat suitable for all seasons opera- tions. Skum," that represents a new and different concept for the removing of oils and organic material from the bilge. De-Skum boat bilge cleaner is a complex enzyme product that di- gests and biodegrades oils and or- ganic material present in bilge water. De-Skum actually removes the oil by turning it into carbon dioxide and water. The enzyme for- mulation is a protein-based catalyst that is similar to a septic tank or stomach enzyme. De-Skum slowly biodegrades oils and organics leaving no residue, sed- iment or by-product to remove. The bilge discharge will not produce an oil slick or foam if the digestion time and dosage are adequate. De-Skum can be used as a cure or preventive using about one ounce per 100 gal- lons of bilge water for a cure and half that amount for a preventive. De-Skum is nontoxic, 100 percent biodegradable, nonallergenic, non- flammable and will not harm hu- man beings, skin, wood, plastic, vi- nyl, rubber, metal or other material. Marine Video, Box 300MR, Central, IN 47110. Borers and controls corrosion of steel with no expensive downtime. Call o write for free case histories? Opportunity to Acquire an Upgraded Complete Operational Unit (Including New Components). Hull Size 30' x 100' (including new wing tanks). • Cat D-399 Main Pump Drive (rebuilt). • Istrouma 18" x 16" x i3" Main Pump (new). • Cat IV343 Hydraulic Pump Drive (rebuilt). • Hydraulic System (new pumps, tank, cooler and lines). • V8-92 Detroit Hydro Jet Assist (rebuilt). • V6-92 Detroit Digging Jet Assist (rebuilt). • 5 New Hydraulic Winches: ladder, swing and spuds • Miller 25KVA Generator - wiring, lights (new). • Sperry Gyro System (new). • Ladder A-Frame and Spud f rames (new). • Outside Wing Tanks i \ 5 \ 65' (new). • Bilge Pumps (2)8", 3". 2", 1" (new). • Redesigned and Elevated Control House (new controls >. WORK BARGE: 20' x 46' Hull with 50' Boom and 2-drum Diesel-Powered Hoist; hull tilled with flotation foam; 2500-gallon diesel storage fuel tank and pump. Steel Discharge Pipe: 1.450 ft. new; 1.550 ft. used for two months. • ( t()) 8' x 16' x 3' Pontoon Floats (new). • (2) 16' x 25' x 3' Elbow Barges (new).